I’ve had a busy last couple of weeks, with back-to-back sets of houseguests to entertain, take care of and clean up after. It was fun, but I’m glad to be back to my regular routine…and that includes getting my Tuesday TWD post up. Luckily, this week’s pick, courtesy of Clivia of Bubie’s Little Baker, couldn’t be easier. The world’s simplest cookie dough, made of just maple syrup, brown sugar, butter and flour, gets a quick-mix by hand. After a brief rest in the fridge, and only seven minutes in the oven, Translucent Maple Tuiles are ready! Tuiles are crispy, buttery, lacy-thin cookies. The coolest thing about a tuile is that, while still warm from the oven, it’s pliable. If you don’t want to cool your tuiles flat on a rack, you can gently curve them around a rolling pin, or roll them more tightly, like cannoli tubes. I followed Clivia’s suggestion to use a “shave” less butter than the recipe called for. They come out of the oven a little greasy, so I was glad I did. R and I enjoyed our maple tuiles with a little bowl of ice cream. For the recipe, see Baking: From My Home to Yours by Dorie Greenspan or Bubie’s Little Baker. Don’t forget to check out the TWD Blogroll! Love the picture! They look great! I loved this recipe! wow yours are simply perfect! they look crisp and wonderfully golden brown. Yes, they WERE rather buttery (greasy) – but good! Love your photo, you’ve really captured the curved nature of them! Glad they were a hit! I got out my Christmas china, I posed everything just so. I tried to be arty about the shot. I thought my tuiles looked great. I figured I would WIN this week…but NO NO NO…I get over here and yours look 100% better draped on the rolling pin. I know you think I am going to give up, but I am not…I’m going to keep trying until someday, somehow, some recipe, MINE IS GOING TO LOOK BETTER THAN YOURS. In the meantime, not holding my breath. Stunning, absolutely stunning. Wow–beautiful tuiles without all the drama! Want another houseguest? Glad you’re back to your baking schedule. Love the photo too. I love your photo! The only time mine were ever curved was on the rolling pin 🙂 They never set up so once I removed them, they flattened right out. Mine were really greasy too, if I make them again I’ll definitely cut the butter. Beautiful tuiles. These were fun, weren’t they. And so easy to make elegant. I love how my blog entry is all about how easy these were supposed to be, and yours is all about how easy they actually were! 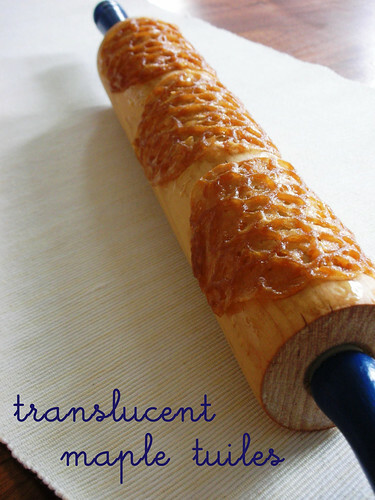 Yeah, you at least got yours on to a rolling pin! Awesome. agreed–great pic. imagining crispy buttery goodness! love the pic with them all lined up! mmm, I love tuiles. These maple ones must be super delicious. Beauiful photo! Your tuiles look perfectly beautiful draped over the rolling pin. I, too, have been so busy with family and traveling that my TWD postings have suffered.